We recently traveled through the rugged, savage and stunningly beautiful Oregon coastline. Our first stop was in Astoria at Baked Alaska http://bakedak.com/ by far one of the best restaurants I have ever eaten at in my life. The food was outstanding. 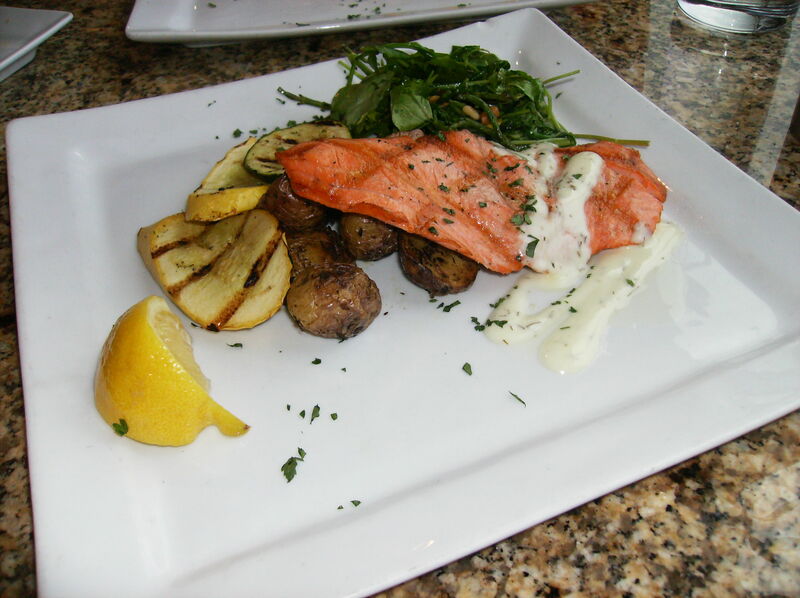 I had the chef’s salmon special of the day and it was so fresh and amazing it simply melted in my mouth. I had an incredible local white wine that I am dead stuffed that I didn’t write down the name of. My husband had campfire salmon and it was outstanding. I had the chocolate mousse and thought I had been taken straight to heaven. My husband had creme brulee which was outstanding. The service was amazing and the chef/owner even came out to chat with us. The price for such an amazing meal was soooo cheap and the view from the restaurant was spectacular. The food was amazing, the view spectacular, the price point outstanding and the staff made us feel welcomed and cared for. If you are near Astoria please take yourself to Baked Alaska!! Eight months ago I also traveled the Oregon Coast. Going 4400 kms round trip from Calgary via motorcycle ranks as one of the most spectacular trips of my life. Smelling the salty air while riding, and seeing the most rugged yet peaceful scenery, has me longing to return again this year. Walking along the beach with the seagulls and with camera in hand truly gives one an opportunity to reflect and enjoy the simplest of pleasures. I am somewhat torn between retracing the same route, and venturing into territory I have not yet had the opportunity to explore. There is a quote that goes something like, “My favorite place is one that I haven’t yet seen”. Hmmm ……. I so agree Carol, this bit of the world is truly spectacular. I would urge anyone who has not been to the Oregon coast to do it once in their lifetime. It is a particularly brutal and savage coast and as we snaked our way down to San Francisco it was interesting to note the differences between the North California coast and the North Oregon Coast. We are so lucky that the US government has seen it as a priority to keep the coastal road open and accessible to everyone. There are no tolls or fees for the roads and the fees into the park never stretch past $5- that is truly remarkable! I admit that we likely won’t return to the coast- it was cold and windy and a harsh climate and we have realized we are more of a 35C pool type of people, but wow, what an adventure that we are so grateful for!